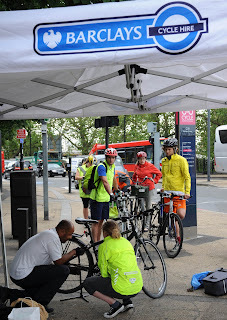 Cycle along to Oval tube station tonight for free bike adjustments. From Wednesday 8 May 2013 Tfl bike hire and superhighway sponsor Barclays is teaming up with social enterprise Bike Works to offer a free Bike Clinic every Wednesday in May and June. The Clinic will operate at the junction of Kennington Park Road and Brixton Road, at the fountain in the middle to the road near to Oval tube station in Lambeth SE11. The clinic will offer cyclists free adjustments and safety checks from 5-7:30pm every Wednesday.